132 BCE After the Bar Kokhba revolt, Jewish communities are established in Lebanon. 1071 Jewish Academy built in Tyre. 1911 Immigration of Jews from Greece, Syria, Iraq and Turkey to Beirut. Nearly 5,000 Jews total. The Jews play a key role in the establishment of Lebanon as an independent state. 1948 Lebanon populated by some 5,000 Jews. 1958 Civil War causes many Lebanese Jews to leave for Europe or the United States. 1971 Secretary General of Lebanese Jewish Community is kidnapped by Syrians, and imprisoned in Damascus with other Syrian Jews. 1975 Muslim-Christian Civil War damages many Jewish homes, business and synagogues. Most of the remaining 1,800 Lebanese Jews emigrate out of fear of the growing Syrian presence. 1982 During Israeli invasion 11 Jewish leaders are captured and killed by Islamist radicals. 1990s Due to the political climate, Jews are unable to practice religion openly. 2005 Less than 50 Jews remain in Lebanon. On 12 July 2006, in an incident known as Zar'it-Shtula incident, the Hezbollah initiated diversionary rocket attacks on Israeli military positions near the coast and near the Israeli border village of Zar'it, while another Hezbollah group crossed from Lebanon into Israel and ambushed two Israeli Army vehicles, killing three Israeli soldiers and seizing two. Hezbollah promptly demanded the release of Lebanese prisoners held by Israel, including Samir Kuntar and an alleged surviving perpetrator of the Coastal Road massacre, in exchange for the release of the captured soldiers. Heavy fire between the sides was exchanged across the length of the Blue Line, with Hezbollah targeting IDF positions near Israeli towns. Thus began the 2006 Lebanon War. Israel responded with massive airstrikes and artillery fire on targets throughout Lebanon, an air and naval blockade, and a ground invasion of southern Lebanon. In Lebanon the conflict killed over 1,100 people, including combatants, severely damaged infrastructure, and displaced about one million people. Israel suffered 42 civilian deaths as a result of prolonged rocket attacks being launched into northern Israel causing the displacement of half a million Israelis. Normal life across much of Lebanon and northern Israel was disrupted, in addition to the deaths in combat. A United Nations-brokered ceasefire went into effect on 14 August 2006. The blockade was lifted on 8 September. As of December 2007, Hezbollah had not disarmed, and continued to recruit armed fighters, with a focus on influencing anti-Government protests in Lebanon. 2008 Restoration of the Maghen Abraham synagogue begins. The country we know today as Lebanon was carved out of the Greater Syria, a country created following the fall of the Ottoman Empire after World War II and put under a French Mandate. During the Ottoman Empire and prior to 19th century, the area known as Balad El Cham extended from Turkey to the Gulf of Akaba. Around 1834, with the first construction of roads following the invasion of Ibrahim Pasha’s armies of Akko, namely the roads from Beirut to Damascus, from Damascus to Jerusalem and from Jerusalem to Jaffa, the Ottoman Empire created three main provinces (wilayats): Mount Lebanon with the Mediterranean Coast from Akko to Turkey (with Beirut as capital), Syria from Aleppo to the Red Sea on the west side of the Jordan river (capital Damascus) and Palestine (capital Jerusalem). In 1920, the Greater Syria under the French was split again into Lebanon (something referred to “Le Grand Liban”) and Syria; and Lebanon achieved its independence in 1943. Lebanon was originally a part of an area called Phoenicia in the Bible and in older sources. Its capital was Tyr that was linked to a small university town the Romans called Beryte or Beritus. Jewish prisoners were concentrated there after the fall of Jerusalem and the destruction of the Second Temple. Kirtsen Shultz, a historian at the London School of Economics, claimed in her book “The Jews of Lebanon” that the first Jews came to Tyr around 1000 BCE. Jewish residents were first recorded there during the time of King Solomon, when it is thought that Jews were involved in selling cedar for the construction of the Temple in Jerusalem. However, it is more likely, as recorded in the Bible, that these trees were sold by Hiram, King of Srour (Tyr) without any Jewish middlemen. (Source: St Takla Coptic Bible: http://st-takla.org/Full-Free-Coptic-Books/FreeCopticBooks-002-Holy-Arabic-Bible-Dictionary/06_H/H_247.html). Little is known about the history of Jews in the area subsequent to that first dispersion, except for some ancient tombstones found in the port area of Saida (Sidon). (Source: Ferdinand “Fred” Anzarouth). Saida and Tripoli were the main commercial centers of the Mediterranean coastline. In 1173 Saladin expelled the non-Muslim from Jerusalem and Safed. In that same year, Benjamin de Tudela, travelling from Zaragoza to Jerusalem (1165 to 1173) reported that there were about 50 Jews in Saida, mostly working in the dyeing of threads and textiles. A census, conducted for the Ottoman authorities by Nabil Khalife in 1519, reported the presence of 19 Jews in Beirut, probably having fled from the plague that ravaged Jerusalem in about 1514. There is a reference in the Jewish Encyclopedia of 1905 to 5 Iraqi Jews who had settled in Beirut. They were from the Levy family and lived near Saint Elie Catholic Church and the Assaf Mosque. In 1807 they built a synagogue named Mesguad Ladek (demolished in 1930). Many Ottoman immigrants moved into the same area that became known as Haret el Yahoud (the Jewish Quarter). Over the years, Jews from Akko (1809), Greece (1821-30), Egypt, North Africa (1837), Aleppo and Damascus (1900-1948), Iraq and Iran (1900-1955), and Ashkenazim from Europe (1833,), also settled in the Lebanon. The port of Beirut became important after the decline of Akko in the 19th century. (Thomas Philipp, ACRE. The Rise and Fall of a Palestinian City, 1730-1831 , Columbia University Press, New York, 2002). In June 1860, following civil unrest and rioting between the Christian and Druze population in the town of Deir El Kamar, Barook and Hasbaya, the Jewish families from these cities moved to Aleh and Damascus. Among them the Zalt, Dahan, Khabieh and Zeitoune families. Those from Hasbaya became known as Hasbani. In around 1869, one of the Picciotto families (wealthy traders and consuls in Aleppo) emigrated from Aleppo and built a mansion for themselves in Wadi Abou Jamil, close to Beirut. This became the new Jewish Quarter of Beirut. By 1940, most of the residential houses of Haret el Yahoud had been converted for commercial use as their owners moved to Abou Wadi Jamil. Haret El Yahoud was destroyed in the Civil War of 1976. The scale of the immigration into Lebanon can be seen from the Montefiore censuses of 1846-1861-1884-1885-1889-1893-1895. Jews lived in the following cities: Beirut, Saida. Tripoli, Deir el Kamar, Barouk, Hasbaya, Tyr, Aley and Zahlé. After the construction of the Beirut-Damascus railroad in August 1895, Aley became a popular weekend destination for the Jews of Beirut. By the 20th century, the Jewish communities of the following towns had vanished due to emigration to the larger cities – Baalbek, Deir el Kamar, Ramiche, Mokhtara, Hasbaya and Tyr (where Jewish emigrants from North Africa bound for Safed settled in 1834 following the devastation of Safed in an earthquake). The 20 families of Hasbaya left the town after riots in 1860. Ramiche had only one remaining family - the Grunbergs who owned a cheese factory there until 1911. A SMALL COMMUNITY OF AROUND 200 JEWS REMAIN IN LEBANON BUT FEEL INCREASINGLY ISOLATED. BEIRUT — Tucked away in Wadi Abu Jamil, a neighborhood near downtown Beirut, is the only standing Jewish synagogue in Lebanon, and its renovation is almost finished. 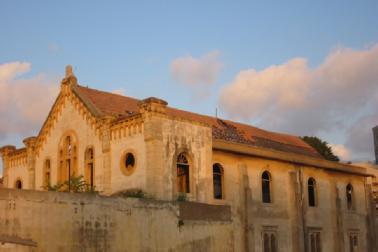 The Maghen Abraham Synagogue, built in 1925, was abandoned and closed down a year after the start of Lebanon's civil war in 1976. A few years later, in 1982, the synagogue was hit by Israeli shrapnel during a bombardment of the Palestinians in the synagogue's neighborhood. The renovations will revive a symbol of the scattered Jews. At one time, over 12,000 Jews lived in Lebanon, but by 1970 there were only 2,000, and even more left during the war. Al-Monitor was given rare access to the synagogue, where no photos were allowed for security concerns. The entrance bears a sign in Hebrew with its name, held up by columns. Inside, wooden chairs covered in bubble wrap are laid out on the stone floor. In the center of the room, a small marble podium stands where the Jewish scriptures, the Torah, will be read. A scaffold blocks a small stage at the back of the room, where a small ornamental closet waits to store the Torah scrolls again. A Star of David adorns the wall as a reminder of whom the synagogue represents. Only about 200 Jewish believers remain in Lebanon. Weary of media attention, they were not willing to respond to Al-Monitor's inquiries. But Bassem al-Hout, a Muslim lawyer who represents their interests, told Al-Monitor that even though the synagogue renovations are nearly finished, security in the country is not high enough yet for it to reopen. "We are waiting for the struggle to end," he said, referring to the regional conflicts spilling into Lebanon from Syria and Iraq. "The region is on fire." Hout stated that when the synagogue is opened, Jews and supporters from around the world will be invited for a dedication ceremony. For now, the Jewish community within Lebanon's borders practices its faith in the privacy of home. Hout explained, "They are afraid of a reaction by individuals," who do not understand their religion is not synonymous with the State of Israel. Certainly, Hezbollah's refusal to recognize the State of Israel has not helped, nor has a series of conflicts at Lebanon's southern border. But spokesman Hussain Rahal was quoted back in 2008 as saying, "We respect the Jewish religion just like we do Christianity … we have an issue with Israel's occupation of land." The Lebanese government and the Israelis are officially considered enemy states after nearly 70 years of complicated border relations and war. Lebanese citizens are prohibited from speaking to Israelis, though there is no law against speaking to the Lebanese Jewish population. Sir, Massoud A Derhally ( Letters, April 8) perpetuates the fiction that Lebanese Jews left as a result of sectarian strife. In 1948 Jews were arrested and interned as Zionist spies. Rioting and antisemitic incidents such as the 1950 bombing of the Beirut Alliance Israelite school, killing the principal, occurred throughout the 1950s and 1960s, culminating in the flight, in the wake of the 1967 Arab-Israeli war, of 5,800 Jews out of 6,000. Hizbollah later kidnapped and executed 10 Jews. Although the Jewish community — which dates back, not to the Spanish Inquisition, but to 1,000 years before Islam — was one of 18 whose “rights” were protected under the Constitution, Jewish civil servants, and even Jewish soldiers who had fought for Lebanon, were dismissed. Jewish schools and synagogues were requisitioned to house Palestinian refugees. The community did enjoy a temporary spike when Jews fled Syria and Iraq in the 1950s, but these Jews were denied Lebanese citizenship. By any definition, this is today an extinct community. The restored Maghen Abraham synagogue in Beirut, no more than a memorial to the demise of Lebanese pluralism, has yet to open. The few remaining Jews are too terrified to self-identify. Some 800,000 Jews were driven from Arab countries: it is disturbing that their history is being sanitised in order to absolve Arab countries from the crime of “ethnic cleansing”. Yes indeed, Mr Derhally — Jews were specifically targeted. Lebanon' once known as the Monte Carlo of the East - the 'This week' team speak to some of the key figures in the country and some of the protagonists behind the devastating civil war that lasted almost a decade. This Week' travels to The Lebanon to witness first-hand the destruction and chaos the civil war has caused to the country. And the wide spread destruction caused to the city that was once called the Monte Carlo of the East -- Beirut. the Monte Carlo of the East -- Beirut. Hezbollah is a social and political movement with a strong armed wing. It was formed in 1980s. Hezbollah’s creation was conditioned by the aspiration of the Shia population of Lebanon to meet the challenges of Israeli expansion and Western “new-style” colonialism. Israel has decided to fortify its border with Lebanon in case of a war with longtime foe, Hezbollah. While it protects the residents living near the border In case of attack, the IDF is always prepared to preemptively attack. Our Daniel Tsemach has the story.